The Vatican- The Whore of Babylon “Church” (Jezebel, Fides, Lady Liberty) – Revelation Chap 17. The Vatican (STATO DELLA CITTÁ DEL VATICANO), which means City-State of prophecy, is the Woman of Revelation 17, Jezebel, the apostate harlot, the mother universal church, the persecutor of the saints that sits on seven hills in Rome and claims authority over the kings of the earth. This is a fact. Rome is the city that sits on 7 Hills. The Roman Catholic Church considers herself the Mother of Christianity. She is decked out in Crimson and Scarlet and adorned with jewels and gold. Notice there is no BLUE in her attire- The color of the garments of the TRUE PRIESTHOOD (we will discuss this in the future). The Roman Catholic Church is the little stout horn of THE BEAST of REVELATION. The timeline of Daniel’s 70 weeks does NOT include a 7 literal year period of the person of an Antichrist reigning in Jerusalem and setting up a temple, blah, blah, blah like we had been mistakenly taught in the Christian churches. The TIMES> TIMES and a HALF TIME =1260 Years!!! This was the period of the Dark Ages where true believers were persecuted by ROME. Then his HEAD was wounded. Then he was REVIVED. (1909). We are in the last days alright and The True Elect is here to DESTROY the ROMAN EMPIRE that is ruling the world. For 1260 years the papacy ruled over Europe, from 538 to 1798. During these dark ages the papacy exercised both political and ecclesiastical power, the woman rode the beast, the beast that was. The papacy lost its political power February 15th, 1798, with the capture of Pius VI by the armies of Napoleon, and it lost the last of the Papal States, on September 20th, 1870 when Italian troops seized the city of Rome, leaving the Pope a virtual prisoner in the Vatican. The Catholic Church had lost her political power and sovereignty, consequently the beast was not. Now, John in chapter 17, sees the harlot in her final phase after she has regained her lost political power (sit on the beast), and the world wonders at her revival. Papal sovereignty was restored February 11th, 1929 with the signing of the Lateran Treaty with Benito Mussolini. And yet the beast is. It has ascended back out of extinction, or the bottomless pit, and proceeds from there to its destruction. The Harlot (THE ROMAN CATHOLIC CHURCH) is coming to an end! I believe we have 25 more years before it will be done. Kaput. Final. I will explain the timeline in another post. For now just know that there is NO 7 year period of tribulation. That is a flat out LIE of the RED DRAGON (HA SATAN) which has Lied to the true believers and led them astray. 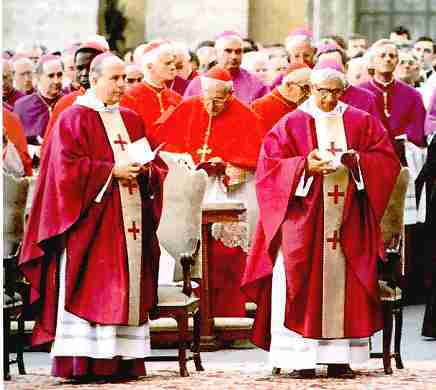 (Popes wear the red dragon on their vestiture also). It was a period of 1260 YEARS that ROME RULED THE WORLD. “She” the HARLOT is Losing her power and will do everything in these last days to persecute YHWH’s True elect. The mark of the BEAST is SUNDAY WORSHIP and not honoring YHWH”S SABBATH. (The 7th day Sabbath- NOT SATURN’S DAY). They have even perverted the name of the day of the week. The Gregorian calendar is also an abomination to YHWH. This is the Abomination that brings DESOLATION. You are following traditions of men. Not YHWH. There is no word about the DAILY- “SACRIFICE” being cut off in the original text either. ANOTHER LIE. They inserted the word “SACRIFICE” to throw you off. It just reads “DAILY”. We will go into that as well later. Get out of the SUNDAY CHURCHES ASAP! QUIT WORKING ON FRIDAY EVENINGS AND SATURDAYS!! You will LOSE YOUR SALVATION if you stay there! You are working for the Beast Roman System! YHWH is not playing with this folks! Be Forwarned. Posted on February 14, 2013, in Book of Revelation, Christian Paganism, ISIS, spiritual warfare and tagged 70 weeks of Daniel, Fides, Jezebel, The Beast of Revelation, The Vatican, The whore of Babylon. Bookmark the permalink. 3 Comments. You know your stuff, Av Yahweh is truly using you, it is no coincedence that I found your blog . Nice to meet you! It’s wonderful to find another true child of YaHuWaH.